I mean, they’re little, not far off from being brand new humans. They don’t have the life experiences an adult has, or the brain development or cognition of an adult. They also don’t have the same communication skills as adults. Toddlers, like babies, know what they want. However, sometimes they just don’t know how to get it, nor understand why they can’t. As adults, it’s up to us to guide our children to learn how to cope with their emotions, and to teach them how to handle their anger and frustration so instead of bursting out uncontrolled, it is identified, communicated, and resolved. Toddler temper tantrums are simply a (very challenging) form of communication to let everyone know they have a need that isn’t being met. Their need for independence, for instance, might show up as a tantrum when they get handed a juice box with the straw already inserted. Fang, who is just about 1.5 years old, almost always wants to insert the straw herself! And she lets me know very loudly and clearly if I’ve already stuck it in. A toddler’s need for routine might show up as them throwing an angry fit when you hand them the blue cup when they were expecting the orange cup (you know, because they remember last week when you gave them the orange cup one time, and aren’t thinking of all the in between days when they got any other cup). You know how some people have a favourite coffee mug, and at the start of their morning they just want to sit and relax with their cuppa joe before the kids wake up… except when they go to make their drink, they find the mug is in the sink full of dishes that didn’t get washed the night before. It’s a bit of a disappointment, right? Same idea… except toddlers can sometimes have very big feelings about things, and so they explode when they don’t get what they’re expecting. Toddlers might communicate their need for food or sleep by having a screaming meltdown in the grocery store check out line. I know I get a little hangry if I’m shopping while hungry. I’ve just learned how to deal with it (or avoid it). Eventually, our toddlers will develop that skill, too. So what can we parents do to help our littles handle those big emotions, and tame the toddler temper tantrums? Fortunately, plenty of parents have come before us, and are willing to share their best tips for getting through this developmental stage. What is your best tip for dealing with the dreaded terrible twos/threes tantrums? What do you say to your child in the midst of a tantrum? How do you follow up afterwards? Since this list is so amazing, it might take a while to read. Here’s a hyperlinked table of contents, just in case you need to come back later to finish. It’ll help you find your spot more quickly, so long as you remember which tip you left off at. By ensuring our child’s thirst and hunger needs are met, we can reduce the chance of tantrums, simply because they won’t be hungry or thirsty. And we can be like the Scouts and “Be Prepared” by keeping a snack and drink handy when we’re unexpectedly or unavoidably out with the kids for long periods, or when it’s close to a meal time. I’ve found since I started meal planning, I’ve had the right foods stocked in the house, without running out of those portable favourites. If you haven’t started planning yet, check out this easy to follow tutorial. Although Brianna Martin from Disciple Mama prefers to avoid tantrums in the first place (don’t we all! ), she ensures her son gets adequate rest to keep him fresh and less likely to throw a fit. “First off, I try to avoid tantrums by being aware of my son’s triggers. He’s really sensitive to disruptions to his nap and bedtime, so I try not to mess with those unless it’s really important or unavoidable. When Monkey (almost four) was still napping more than 15 minutes a day, I planned my day around her sleep schedule. She was a miserable little girl if she missed nap, or even if it happened later than usual. And when she was miserable, so was I! We also implemented an evening routine to help settle both littles so they got the rest they needed each night, as well. 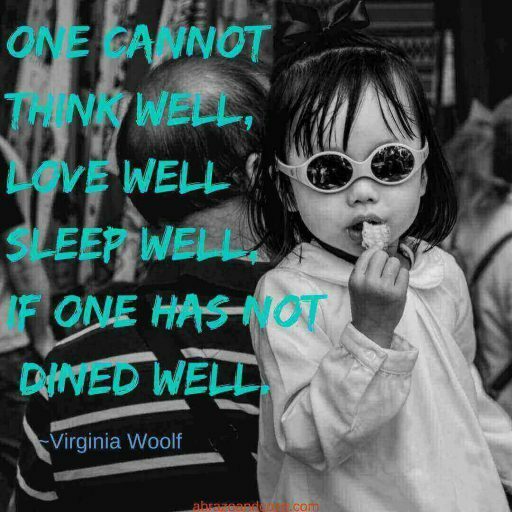 It is occasionally inconvenient, but usually not a huge challenge to schedule our activities before and after (and between) naps. “The best way to deal with tantrums is by doing your best to avoid them in the first place. Offer choices and distractions, offer yourself some tequila (kidding). If there’s a way to avoid Rage Level, everybody wins. “If the tantrum is already in progress, the best thing to do is let it fade on its own. The rage is real, and you have to just let it fizzle out. When it’s over, acknowledge those big emotions, talk through the problem, and reinforce any consequences. When a child has a choice, you’re fulfilling (at least partially) their need for independence. When you see your little darling showing the first signs of upset, a distraction can prevent the tantrum, so you have a chance to address the issue before the tantrum even starts. You know your child best, and you can start to see not only the signs of imminent meltdown, but also the patterns. Once you determine what sets off your tot, you’ll be one step closer to the light at the end of the tunnel. Samantha from Journey to SAHM focuses on finding the root cause of tantrums to prevent them in the first place. “Prevent them from happening. Reasoning with a tired toddler is tough. Find triggers and avoid them. “I talk to my daughter at her level and say ‘that made you feel sad, didn’t it?’ She’s just learning what emotions are and likes to hear that I understand how she feels. She responds and then we talk about it from there. One of the common themes in several responses was the advice to remain calm. Although sometimes a challenging feat for parents to accomplish, consider how hard it must be for your out of control toddler when their parent loses control as well. Yesenia Witcher, a parenting coach, leads by example. On the flip side, encouraging your child to be calm will help tame those toddler temper tantrums, too. Allie LaVigueur from Vigor It Out finds comfort, breathing, and counting helps to handle temper tantrums. “My two year old is a super emotional and sensitive child. “THIS little 2.5 year old tantrums ALL THE TIME! One thing that I’m amazed actually helps her a lot is to hold her in my arms for comfort, tell her that I love her but right now she needs to calm down and won’t get what she wants every time, and guide her in deep breaths. “We count the breaths together on our fingers and by five she is typically much calmer. Jalina King from This Side of If offers understanding, security, and love to help work through toddler temper tantrums. “Children play off your emotions. I’ve seen it with my own toddler, and I’ve seen it with the pediatric patients I had in my five years working at a trauma center. If you remain calm, your child will calm down quickly, too. “Instead of allowing yourself to become frustrated or overwhelmed, understand that your child is already feeling that way. Set an example of how you manage your own emotions by remaining calm and giving them words to express their emotions and needs. “In the midst of a tantrum, I make sure my son is safe, and I distance myself while remaining visible. This separation benefits both of us! “For the worst tantrums, I remove him from the situation. When he doesn’t calm down enough for me to talk to him, I take him outside for fresh air or distract him by offering him some water. This breaks the tantrum and calms him enough so we can talk. Think of an occasion when you were trying to convey a message to someone and you thought they weren’t listening (like maybe you wanted to let your partner know about an important upcoming event, but they kept glancing at their phone while you were talking – I might be talking from experience here…). Now think of your little one, who doesn’t have the experience, communication skills, and brain development that you do. Imagine how frustrating that must be for them in similar circumstances. When you let them know you’re listening and hearing, their frustration level will drop. Jenny Welsh from Home After Three discovered that active listening works wonders for calming the stormy tantrums. “After some trial and error, I discovered that the majority of my 3 year old’s tantrums are because he thinks he isn’t being heard. So, now, I stop and ask him who he thinks isn’t listening. “When he tells me, I ask him what it is that he wants that person to know. Then I guide him through how to calmly get their attention and say what he would like to say. 1. skill in perceiving, understanding, and managing emotions and feelings. And now that you know, I’m sure you’ll agree it’s an important aspect of human development. Toddler temper tantrums, though unpleasant, are ideal opportunities to help our children develop their emotional intelligence. Audrey Marshall, mommy to two, and blogger at Mommy Enlightened follows a strategy that boosts her toddler’s emotional intelligence. “When my toddler is having a tantrum, I make sure that I empathize with her and help her name the emotion. She’s a little human who has big feelings that she doesn’t yet know how to deal with. “I also try and offer her choices. If she’s upset that she has to stop playing because it’s nap time, I ask her if she’d rather read a story or just go to bed. I’m allowing her to have a decision, which I think is important whenever possible. Communication is not a toddler’s strong suit, but when those skills are incrementally taught as opportunities arise, their skill set grows. Eventually, they become proficient enough to get their meaning across without the tantrums. Wouldn’t that be nice? Although it can be a long term project, teaching your children effective communication strategies will help them move through the toddler temper tantrum phase more quickly. And ultimately, our goal isn’t just to stop the tantrums, it is also to help our wee ones grow up into people who know how to communicate with others, regardless of the circumstances. Leisha Ouimet, mom of two, and blogger at thehomemadesisters helps tame the tantrums through communication. “Giving your child skills to communicate their feelings is key. Start giving them words for their feelings before they can talk. “Tantrums are more likely to happen when frustrated and they don’t know how to express themselves. Although similar to the last tip, “discuss it later” takes a slightly different approach to teaching communication skills. Rather than working through the tantrum with words, wait till the tensions have lessened, and benefit from the added calm after the storm has passed. When you pick up the topic later to address the issues, you and your child will both be more likely to listen and hear what the other is saying. 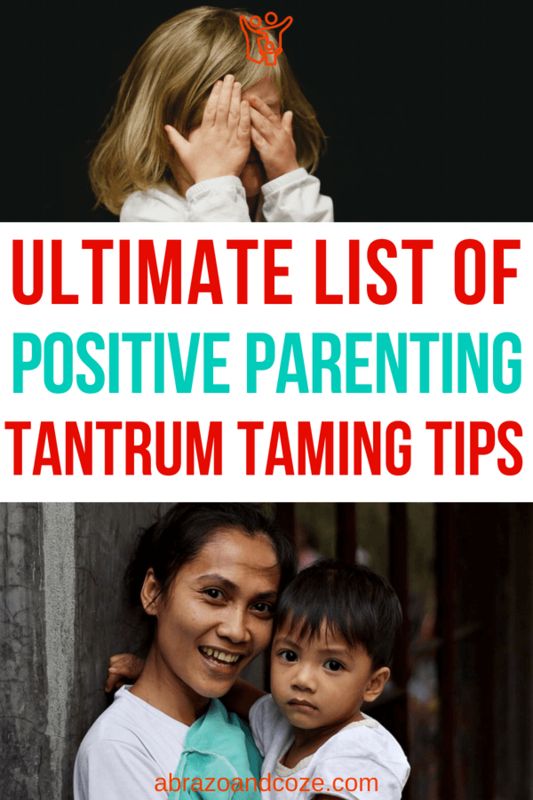 Allie McCabe, Positive Discipline Parent Educator and blogger at Mommy Messenger follows a similar strategy to deal with tantrums, waiting till the tension has passed before bringing the outburst up for discussion. “That’s all the talking that needs to be done. It’s not the time to teach a lesson or reason with them. “Once the tantrum is over, give a hug and move on. Many meditations, or mindfulness rituals, or calming strategies include breathing exercises. Controlled breathing exercises have a positive physiological effect on the body, which can help bring your toddler’s outburst to an end. Lindsey Ranger, from Side by Side Learning finds success in helping her children breath deeply. “When my kids are having a tantrum I try and calm them down by reminding them to breathe. If they are still struggling then I have them look into my eyes and we take deep breaths together. Allowing them to mimic me helps them remember how to calm down. “Once they are breathing and not hysterical then we talk but the situation. We talk about good reactions and poor reactions. That it’s okay to be upset but throwing a tantrum isn’t helpful. That old adage “out of sight, out of mind” is a wise bit of knowledge, especially when is applies to tantrums. When you’re very young, and overwhelmed and frustrated, and you’re looking at or surrounded by whatever is making you angry, it’s hard to calm down. Just as you might take a walk to calm down when you’re angry or overwhelmed, removing your toddler from the source of their big emotions will aid in calming them down, and ending the tantrum. Christine M. Leger from Tapped Out Traveller$ finds success with this approach. “We separate them from the cause of the tantrum – usually the sibling, but if it’s in a store, we leave the store – and wait for them to finish saying their piece, mostly inaudible. “Take a few deep breathes and remind them why they need to behave or why they can’t have the toy or treat or whatever was the cause. Sometimes, when you’re frustrated, you just need to blow off some steam. It’s no different for toddlers. If you aren’t able to lessen the eruption, give them a safe place to get it out of their system before moving forward to find a resolution. Marie Beausoleil, mom of six, Blogger at Just Plain Living has six children (ranging from 4 to 22), two of whom have autism. “I don’t believe in the ‘terrible twos’ – I actually like two year olds. “It’s ROUGH being a little person who barely understands the world and is always being told what to do. 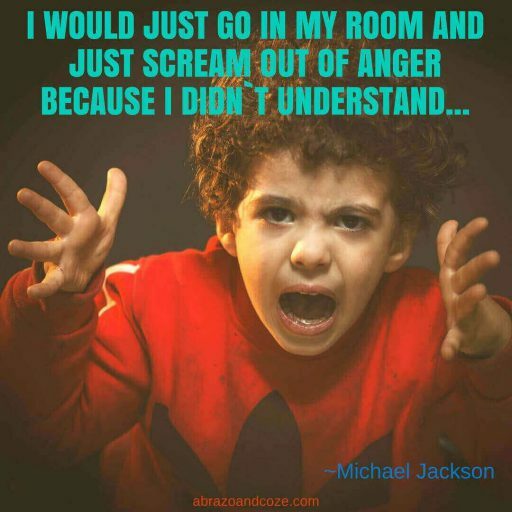 Tantrums happen when a child can’t understand the world and can’t express themselves. I can understand that – I’m a brain cancer survivor and I get frustrated when I can’t remember words or understand things around me. It’s harder when your time in the world is measured in months. “My five year old daughter has difficulty expressing herself when she’s upset, and sometimes very small things can set her off (food touching, water to the wrong level in her cup …). If we can’t distract or otherwise figure out what’s setting it off, we remove her from the situation to a safe place and let her stomp and scream until she gets it out of her system. Regardless of what approach you take, consistency should be a priority. When your toddler knows the general routine, it’ll help them get past the outburst faster. Then they’ll be ready for talking it out, or hugs then talks, or whatever you have for a routine. Fa, blogger at Being Healthy Blog finds consistency in her approach helps her toddler reach calm faster. “I am a mum of three and I feel age two is such a magical number. I adore kids at that age. That is the age where they are looking for independence and yet so dependent on their parents. Having said that, their tantrums are in no way cute. “When my toddlers had their tantrums, I try my best to ignore it. There is no way that they would listen in that situation. The best approach would be to ignore them unless they are harming themselves or others. I pretend to go on with my usual business while biting my teeth. The tantrum usually fades when no attention is given to it. Validation is the recognition and acceptance of another person’s thoughts,feelings, sensations, and behaviors as understandable. Self-validation is the recognition and acceptance of your own thoughts, feelings, sensations and behaviors as understandable. One of the goals many parents have during the tantrum stage is helping their child start to recognize and accept their emotions, as big and difficult as they sometimes can be. 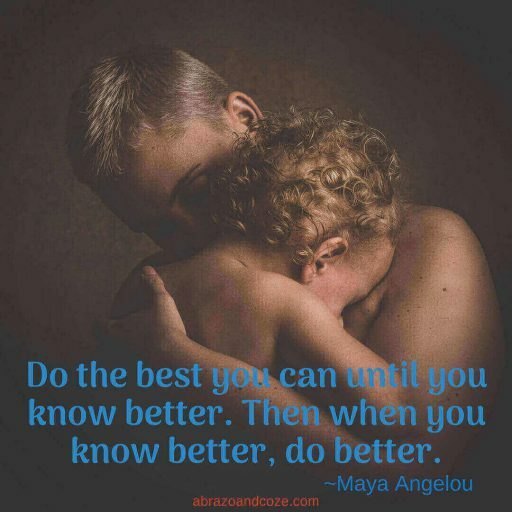 Eventually, once you kiddo starts to slowly gain that understanding, they are able to self-regulate more effectively… which means fewer and fewer tantrums. Rachel, A.K.A. The Analytical Mommy aims to validate her children’s feelings as an overriding strategy to tantrum control. “As a mom of three, I’m no stranger to tantrums! I have learned over time that while there are many strategies for calming a tantrum, the best course of action is often to find out the root of the tantrum. This way you can calm the current one and minimize or avoid future ones. We’d all love fewer tantrums right? “Squat down so that you’re eye level with your little one and tell them you have a question for them and will wait until they are ready and done crying. “The first few times you do this it may take a while for them to calm down but stay firm and wait. Once they stop, calmly ask them why they are crying and how you can help. “Often they won’t remember why they are crying in which case you can make suggestions ‘Are you tired?’, ‘Are you hungry?’ etc. After a few times, they will get used to this routine and it will become easier. Children, toddlers especially, like to exert their independence. So much of their time is spent having other people tell them what to do, when to do it, how to do it, and they can start to feel out of control. Those feelings of dependence can contribute to toddler tantrums. By giving them a choice on how to get calm, you’re giving them an opportunity to feel in control and independent. Courtney P. from Totally Awesome Toddler Adventures finds success in this approach. “As much as possible, validate their feelings. Acknowledge the emotion and the root cause of what they view as the problem. “I offer suggestions to them depending on where we are. If we’re in public ‘Do you want to take a deep breath or have a hug?’. However, if we’re at home ‘Do you want to go calm down in your room with me or alone?’. “It’s also really important to acknowledge our own feelings in these interactions and how amping up our reactions can increase the intensity in their tantrums so a lot of self care when able outside of tantrums for caregivers is important to keeping your cool. If you’ve ever taken any leadership or business courses on productivity or motivation, odds are high that you’ve heard about the benefits of empowering others. The same idea holds true for raising your toddlers and getting through the tantrum phase. By empowering your children, you boost their confidence, their self-reliance, their social and emotional development… basically, many of the great qualities that will help them achieve their goals in life. Rai from Rai Says empowers her child by limiting “no” and maximizing “yes”, giving them autonomy, and finding opportunities for them to help. By doing so, she reduces the number of tantrums she needs to work through. “But you can minimise the tears by finding many opportunities to say yes. “When your child puts himself or herself in the position you need to say no, offer an alternative activity that’s acceptable. In some ways, kids just want to have autonomy over their lives in some way. They watch adults doing things all day and they’re curious to mimic us and copy us. They don’t understand the level of danger certain activities entail so give them something they CAN do. “Empower them. Find opportunities where they can help, even if it’s as simple as giving them a bowl with a wooden mixing spoon so they think they’re helping while you’re cooking in the kitchen. “Set boundaries. Be firm with your boundaries, but try to say yes more often than you say no by finding activities your child can participate in. When you need a quick end to a tantrum – for whatever reason (you’re on a tight timeline, your patience is worn too thin, etc), it can be useful to offer a distraction to your kiddo to help end the tears. Keep in mind, as effective as distractions can be in the short term, they don’t assist in lessening tantrums in the long term. Nor do they help your child learn how to deal with whatever issues were causing the outburst in the first place. I’ve saved the best tip for last. It might be the hardest, as it requires you to change your thinking, and your vocabulary. And a change in mindset can be quite a challenge. But, if you really want to get a handle on toddler temper tantrums, you’re going to want to go to the effort to follow through on this tip. I’ll let Stormy from Pregnant Mama Baby Life explain. And I’m going to bold the best part of her response. Because it really is that important. “My best tip would be to not see it as a tantrum, but an expression of emotion that just happens to be inconvenient. “Your child is not trying to stress you out. They’re simply doing their job as a child trying to get their needs met – they aren’t old enough to know the difference between a want and a need, so the two are often confused. “I would focus on connection before correction. A child having a tantrum is not in the right mental state to listen or learn that their behaviour isn’t ideal. Instead, empathise and communicate to your child that you know they are very angry and upset, and that you’re here to help them. “Comfort them after a tantrum – they don’t enjoy it any more than you do! 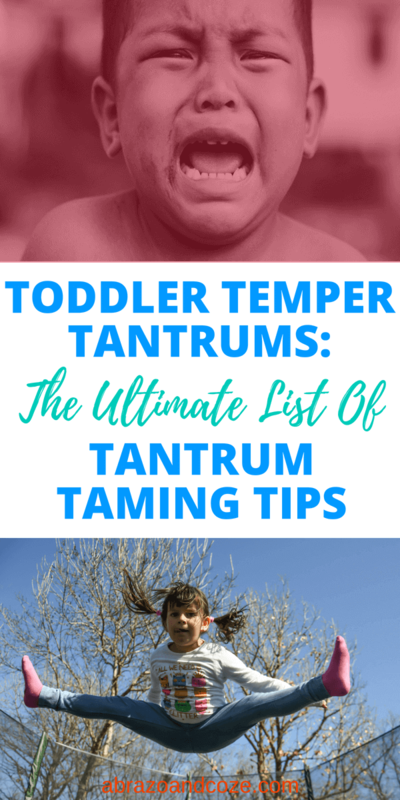 Finally, because it ties in so nicely with Stormy’s tip, I’m ending this ultimate list of tips to tame toddler temper tantrums with this perfect little analogy from Parenting Coach Hannah Canavan who blogs at Adventure Travel Family. “The hardest part about toddler temper tantrums as a parent is feeling the need to ‘do something’ about it. Ensure your littles aren’t hungry or thirsty by keeping snacks and drinks available, especially if regular meal times aren’t going to be followed. Try your best to avoid skipping naps, and aim for consistent bedtimes and wake up times. A rested toddler will be a happier toddler. Provide opportunities for your tot to exert their independence, which will help them feel in control and less likely to tantrum. Pay attention to your little one’s tantrums, and figure out their triggers. Once you know what the causes are likely to be, you can attempt to avoid them. Speak quietly, take deep breaths, and demonstrate the calm you want your child to emulate. Speak with kindness, encourage deep breaths by counting breaths, offer physical comfort. Understand that your child is feeling overwhelmed and frustrated or angry, so don’t add to it by allowing yourself to feel that way, too. Give your child a safe space to finish the tantrum, and separate yourself to give you both space. Offer a drink, some fresh air, and help your child find the words to name their feelings and needs. Ask them who isn’t listening, and help them find ways to get that person’s attention and to get their message across. Help your child name their feelings, empathize with them, teach them it’s OK to have feelings, and how to deal with them. Give your child the words to identify their emotions, and talk about why they’re upset, how they can act differently next time, and find a solution. Later, once the tension and stress of the tantrum have passed, address the root issue with your tot. Listening and hearing will be easier when the chat happens during a more relaxed time period. Encourage your toddler to take deep breaths, breath with them, and once calm, talk it out. have frequent conversations on how to deal with conflict and frustration when not working through a tantrum. Whenever possible, remove your kiddo from the cause of the fit. Once it’s out of sight, they’ll have an easier time calming down so the issue can be addressed. Sometimes kids just need to get the frustration and anger out. Provide them a safe place to be angry, yell, and stomp. Whatever your strategy is, keep it consistent so your toddler knows what to expect, which can resolve tantrums faster. Help your toddler understand their feelings are valid and that it’s OK to have those big emotions. Also help them manage their emotions so they can deal with them better in the future. 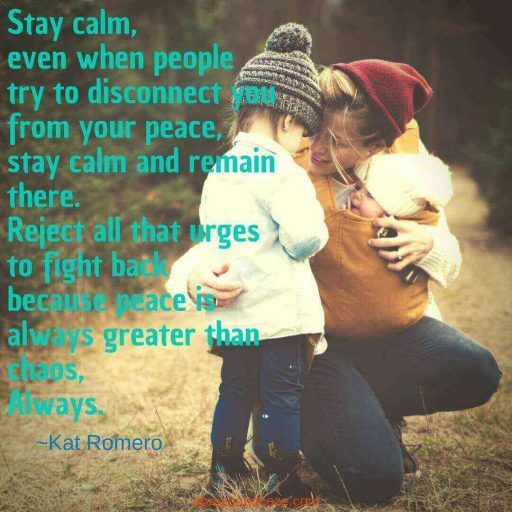 When they’re in the midst of a toddler temper tantrum, offering them a choice in how to get calmer can provide a much needed sense of independence and self-reliance, and boost their self-worth by showing you respect them enough to give them that choice. Limiting how often you say no, and maximizing how often you say yes allows your tot some control over their life, increases their self-worth, and provides a boost to their social and emotional development. If you’re in a pickle, and need a tantrum to end more quickly, try a distraction to divert your child’s attention from whatever is causing them angst. Don’t think of it as a toddler temper tantrum. It is merely an expression of emotion that is inconvenient. Focus on connection first and save any lessons for another time. Comfort them afterwards – the outburst is just as stressful for them as it is for you. 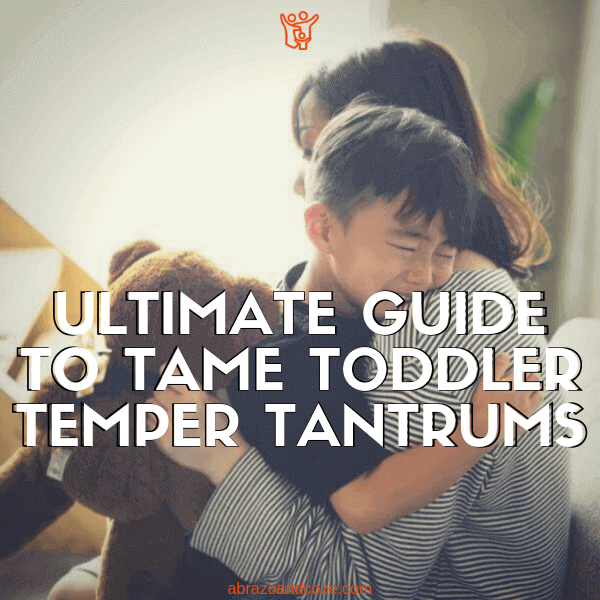 Now that you’ve read through this huge list of tips to tame toddler temper tantrums, you’ve got the strategies you need to help your toddler get through their big emotions, and help progress their social and emotional development. 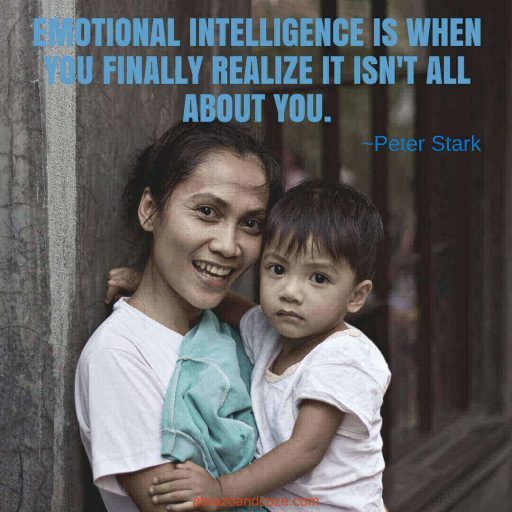 It’s important to remember that this is an ongoing process, and our kiddos don’t learn overnight how to deal with their big feelings, no matter how expert their parents might be. Do your best with the information you have, and keep working at it. Your future self will thank you. As awesome as this list of tips is, I bet there are even more strategies that have worked for you. How do you help your kids manage their big emotions? Let me know in the comments what works for you. I always find it interesting when tantrums happen and we may not be looking for the true cause. My daughter has a speech delay and the amount of tantrums I get when she’s hungry but not telling me other then a tantrum is amazing. Monkey (4) also has a speech delay, and sometimes gets so frustrated when she is trying to communicate something and we’re just not understanding. I think the frustration is totally understandable. I was at a playground last week, and there were two boys who were speaking French. After they heard my youngest yelling “Allo! Allo!” (her version of “hello”) they started speaking to me en francais, and I fumbled to get a few words out to let them know I only spoke a little French. They kept trying to have a conversation with me, and it was a big challenge, even for me as an adult, to be able to communicate anything to them (my French is VERY limited). This was very informative! I have a 4 year old daughter with Autism and Sensory Processing Disorder; this was a nice list of helpful hints. I’m glad you found value in the list. If all kids responded the same to different techniques, parenting would be a whole lot easier… but since that isn’t reality, I like having a list of options to choose from. I hope some of them help your daughter (and you) through challenging moments. 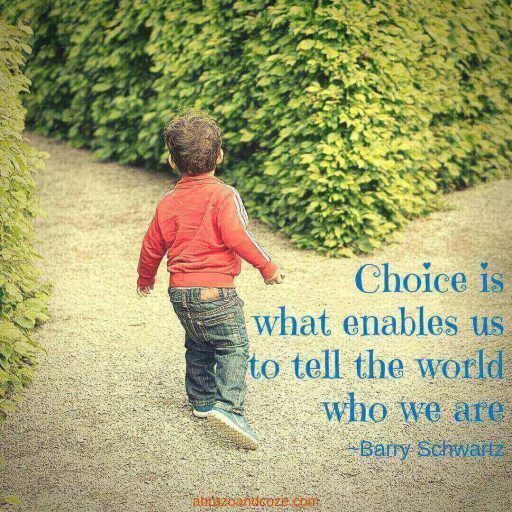 Offering choices and empowering my son helps the most (a threenager). But, thank you for so many other ways to work with him right now! My daughter just turned 3 and her tantrums are at their peak! She was very mellow at 2, so this was unexpected. Thank you for the tips! It`s surprising when things change so quickly. My eldest was very gradual (and kind of late getting to the tantrum phase). I got lucky with her, as she didn`t get upset and overwhelmed very often or for long. (But I also never said no to her till she was older – I gave alternatives instead. “Yes we can go to the park, but not till tomorrow. Let`s play a game now.“ so that helped, I`m sure.) Middle child is also laid back, but she definitely lets us know when she`s frustrated. Usually when someone isn`t listening. Youngest throws herself on the ground and kicks and screams like in the movies… she`s going to provide some great parenting stories as she gets older, I`m sure!